Independent research shows that Woodworking News is the 'MOST READ' magazine in the industry and that 48% of our readers read no other publication. Published 12 times a year, Woodworking News is packed with news, machines, products, services, agencies, components, application stories, a dedicated Furniture News section and much, much more. 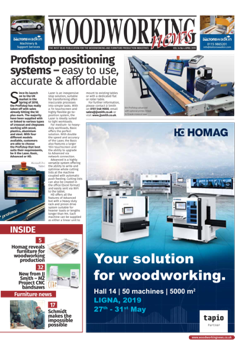 The quality of editorial alone sets it apart from other publications but when combined with a hand picked, controlled circulation that targets every sector in the professional woodworking and furniture manufacturing industry, it provides an unrivalled advertising platform. Now in its 30th year, Woodworking News targets the smallest right through to the biggest companies operating in the marketplace and supplies what is needed in the editorial pages. It prides itself on being the unequalled market leader and that is shown by the fact that it consistently carries more display advertising and more than twice the amount of classified advertising than its nearest competitor! Proof if proof were needed that Woodworking News delivers what advertisers want - results! With an A3 format and a circulation of 7220 plus 1654 online giving a monthly total of 8874 available to advertisers, Woodworking News represents remarkable value. Only decision makers or those involved in the buying process are targeted. Therefore Woodworking News is essential in any marketing mix that targets the UK's professional woodworkers and furniture manufacturers. Based on a researched readership figure per copy of 2.5 readers, Woodworking News readership EXCEEDS 20,000! A figure far, far in excess of any other publication in the market! Advertisements placed within Woodworking News quality editorial will be noticed. A hand built controlled and subscription circulation over a period of over 28 years means that advertisers reach people that matter - decision makers. Woodworking News delivers results. Carrying more advertising than any other magazine in the field is proof that Woodworking News delivers. To view the Features List for 2018, please click on the file below. Plus the circulation is boosted each month by an average of 1654 visits to the online issue.